FreeWave’s 900 MHz ZumLink IPR App Server Radio combines intelligence at the edge with a state of the art high speed radio communication platform. Now users can write applications and integrate measurement, control, data storage and analytics at the sensor/device/radio level AND publish analytics to the cloud or another host system. It simplifies industrial equipment deployments, streamlines access to important data and reduces overall costs. Integrated into the ZumLink radio, the App Server is a secure Linux environment where applications written in languages such as Node-RED can be hosted in a similar fashion to a Raspberry Pi. Background: The operator of a Rocky Mountain based livestock facility approached FreeWave to assist in remote data visualization of water tanks that are vital to its operations. The pain point was that the tank levels could only be observed visually on premise. After consideration of the terrain (mountainous, remote and big temperature swings), sensors and communications infrastructure, FreeWave engineers recommended ZumLink IPR with the Node-RED programming language for intelligent tank data visualization via browser or mobile device. Problem to be solved: The facility has minimal to zero staff most of the time. If a fault occurs such as a leak that prevents a tank from filling, the facility operators are unaware until they visually inspect the remote faulty tank, located a half mile from property headquarters. The operators wanted to reduce the number of trips to the tank facility and remotely monitor all tanks via web-based browser or mobile device. Special Challenges: Because the tank sensor system is solar powered, the wireless equipment had to minimize the additional power load presented to the system. The sensors were powered up a short time for a reading, and then shut off immediately after. Operators requested the need for data to be viewed by anyone with the proper credentials without holes in network security. Since the data was hosted on a cloud service external to the network, all connections were initiated intelligently by the radio when new data was published, and no changes to the existing firewall were needed. Solution: With the ZumLink IPR programmable radio and a custom Node-RED application, the operators were able to monitor water levels in the remote tanks from the cloud anywhere in the world with a wireless internet connection. Why Node-RED? Node-RED is an easy to use visual programming language for IoT application development. Originally developed by IBM in 2013, Node-RED is used to quickly assemble flows of services in the IIoT. Node-RED is available as an open source platform, and the flows created in Node-RED are stored in JSON and easily imported and exported to share with others. Details: The ZumLink IIoT Programmable Radio functions as the foundation of this system, and allows operators to view tank levels and 7-day data trends from a mobile device anywhere in the world. First, the level is measured with a hydrostatic pressure sensor that feeds an analog signal into a FreeWave IOE-4422 Serial IO module connected to the ZumLink IPR radio. The ZumLink IPR radio runs a Node-RED App that turns the sensor on at discrete time intervals, takes a hydrostatic pressure reading, turns the sensor off, and converts the pressure data to a tank level measurement. It then publishes this data to the dweetPro.io cloud-based IoT hosting service. A dashboard created on the freeboard.io service accesses the stored data and presents the live tank reading. 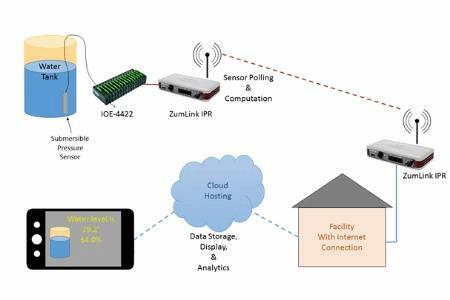 With ZumLink IPR, the IOE-4422 IO serial base and Node-RED, a secure system was created to drive down operational costs by reducing the amount of travel to the site. Operators can now monitor tank levels on a mobile device or browser from anywhere in the world. Node-RED programming language was used to quickly and easily create an App to deliver data collected from analog sensors. The ability to quickly and cost-effectively scale with ZumLink IPR and Node-RED makes the system perfect for any industrial operation.